'Tandoori Chicken' - the very name of the dish starts making my mouth water. A huge favorite of everyone in our family, this is one dish all of us insanely miss since we have shifted to the U.S. Back home in India, our staple weekend dinner used to be Tandoori Chicken and Butter Naan from the popular Chawla Chicken in sector 23, Gurgaon, packed and parceled sizzling hot right to our doorstep, an easy convenient option. Chawla chicken has numerous branches all over the city and the reason for ts popularity is that his chicken has always being upto the mark- juicy, perfectly marinated with just the right hit of spices for you to enjoy the dish. For those of you not familiar with the dish 'Tandoori Chicken' is a popular dish in India which gets its name from the clay ovens 'Tandoor' that they are cooked in. The chicken is marinated in yogurt and India spices for a couple of hours so that the meat soaks in all the flavors. Infact it is quite a visual delight to see the Tandoori chicken being prepared in the tandoor. The meat is threaded on long skewers and then put inside the hot tandoor, which has a high temperature of 800-900F to grill. The high temperatures help to char the meat and give it an amazing flavor and tantalizing your tastebuds with wonderful aromas if you are standing near it watching the chicken being cooked. A few days back my daughter announced that she had a strong craving for having Tandoori Chicken and if I could try making it at home. I have recently acquired a Philips Airfryer (Avance XL) (I will be sharing more about it in another post soon) and found it to be perfect when it comes to grilling meat. I love the way it can fry, steam, grill, bake with just a drop of oil. It actually works. I have tried everything in it from french fries to spring rolls to pies, chicken nuggets, cakes, fish, chicken.... every time with perfect results. The possibilities are limitless but I especially love that every time I grill chicken it is really juicy and moist with all the flavors intact. That is why it is my favorite toy in the kitchen right now and my go-to appliance for most of my everyday cooking. For all those interested you can also check out my recipes for healthy Gujiyas, Papaya and jaggery cake and Spring Rolls that I have tried out earlier in the Philips Airfryer. After arriving here in U.S I was on the lookout for an XL version as back in India only the Viva Model is available. This has a much bigger capacity of 1.2 kg and is perfect for our family of 4. If you too are conscious about your and your loved ones health do consider this as an healthy option. Any questions you have about the airfryer, I would be quite happy to answer to the best of my knowledge and experience as a satisfied customer. This recipe is quite easy and almost as close to the restaurant styled Tandoori Chicken. Do try it and let me know what you thought of it. In a mixing bowl, stir together the yogurt and lemon juice. Add in all the spices, minced garlic and whisk until you have a thick marinade. Take the chicken pieces and make a few horizontal cuts on them. Put in the pieces of chicken in the marinade. Mix till thoroughly coated. Cover and refrigerate for 6-12 hours or preferably overnight. If making for dinner, usually marinate the chicken the day before for the flavors to really seep in well. Turn once or twice in the refrigerator. When you are ready to cook, take the chicken out of the refrigerator. Preheat the Philips Airfryer to 360F/180 C.
After you hear the ding on your airfryer, which tells you that it is preheated and ready to cook in, arrange the chicken pieces in the basket and cook for 8 minutes. Cook for another 8 minutes. Amp up the temperature to 390F/ 200C and cook for another 4 minutes. The chicken should look slightly charred. The best way to know when a chicken is done is when you poke it with a skewer you see the juices running clear. Another way is to insert the chicken with a meat thermometer in the thickest portion between the leg aand thigh and the thermometer should read 165F. Don't worry if you don't have an airfryer alternately you can bake the chicken in a preheated oven at 425 for 30 minutes. Then turn the chicken over, brush it with some oil and cook it for another 15-20 minutes till the juices run clear. Remove the chicken pieces onto a plate and sprinkle some chaat masala on top, serve it hot garnished with the onion rings and a few squeezes of lemon juice. Your Recipe Looks So good PleasE do visit my space sometime. Thanks!! Will definitely be stopping by your space too. I loved Avocado Smoothie with Chia Seeds. Thanks for share it . If you think the only product you can prepare in these devices are snacks so they are not affordable, then you are incorrect. You can prepare at large amount of dishes in them; it just requires a little bit of variation. Both devices come with their own selection of dishes and there are formula guides gradually arriving onto the industry. You should also keep in thoughts that some meals and dishes are more designed for Philips or the Airfryer because of how the devices are designed. Thanks for share tandoori-chicken in philips-airfryer . This fryer is always ideally simple to use too; it does not need pre-heating like an stove and it has a clock. It is also simple to fresh up after use as its sink, stirrer and lid can securely be jumped into the dish washer. wow! Thank's for review. I was not aware of this cooking method. I love the food at all difficult to handle temptation.These foods are good for health. This is one of those dish where you don't feel like you're missing out on anything because there are so many fab textures and flavours! Great recipe this, thanks for sharing this. Yummy! I have an airfryer and I am about to do this tonight. My family will have delicious dinner. 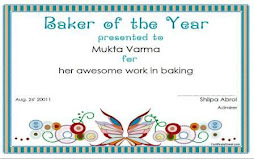 Thank you, Mukta! Celebrate life as it comes your way, both the bouquets and the brickbats...This is my space where I can pen down my everyday thoughts,my feelings, my dreams and aspirations. Cranberry Upside-Down Cake.......and a Reunion!! Thanks for being a part of my blog ! !